ab56309 recognizes MMP25 in western blot. Lyophilised:Reconstitute with 0.5ml sterile PBS. Our Abpromise guarantee covers the use of ab56309 in the following tested applications. WB Use at an assay dependent concentration. Predicted molecular weight: 63 kDa. Expressed predominantly in leukocytes, lung and spleen. Expressed also in colon carcinoma, astrocytoma and glioblastomas. Cell membrane. Secreted, extracellular space, extracellular matrix. 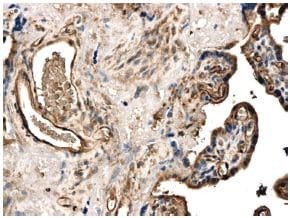 ab56309 at 1/500 dilution, staining MMP25 in human placental tissue section by Immunohistochemistry (Formalin/PFA fixed paraffin-embedded sections). ab56309 has not yet been referenced specifically in any publications. Publishing research using ab56309? Please let us know so that we can cite the reference in this datasheet. There are currently no Customer reviews or Questions for ab56309.